His Excellency Prime Minister Dr. Haider Al-Abadi has expressed his pride in the deep relations between Iraq and France, its stand with Iraq until the defeat of Daesh; His Excellency commended the French participation in the Kuwait conference for Iraq Reconstruction. 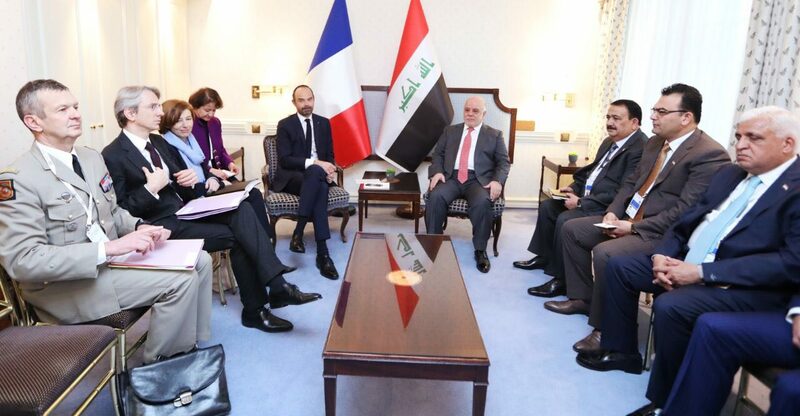 This came during His Excellency Prime Minister Dr. Haider Al-Abadi has received, in his residence in Munich, on Saturday morning, French Prime Minister Édouard Philippe and his accompanying delegation. His Excellency has added: "We continue to pursue Daesh, building up our capabilities, we are looking forward to security, economic and trade cooperation, particularly in the area of restoring stability, which is no less important than our war against terrorism," his Excellency confirming that Iraq a bright example in defeating Daesh and in the perfect relation between the liberating forces and citizens which contributed to gain peace and stability. For his part, French Prime Minister has said: We are pleased with the amazing progress that you did achieve in Iraq, we are with you and we will continue the relationship between our two countries, completing all the tasks until the achievement of full stability, France is supporting you in the successful Kuwait Conference, we congratulate you. He has expressed his optimism about the future of cooperation between the two countries in all fields, stressing that the eradication of Daesh is a priority for France in the region.